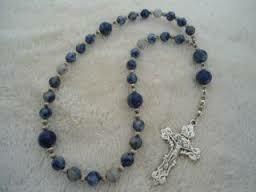 The Anglican rosary came into existence in the 1980's in Texas. It was created by Episcopalian minister Rev. Lynn C. Bauman. Bauman was teaching the many forms of prayer to his congregation, and repeatedly coming upon the idea of prayer beads. He began to wonder what a set of beads would look like that embraced the sacred focus of the Rosary, while reflecting more Protestant symbols. Symbolically, Bauman chose to work with 33 beads, representing the 33 years of Jesus’ life. The rosary he created begins on the stem with a single large bead, which he calls the invitatory. This is the place to invite God into our presence, reflecting a basic tenet in the Anglican Book of Common Prayer. After the invitatory bead there are 32 beads that divide into four sets of seven, each with a single larger bead dividing them. The first of the four large beads begins on the stem, with the first set of seven beads – called a week of beads – beginning on the right side of the circlet. The pattern continues around with three more sets of seven smaller beads, with a larger bead in between each set. Bauman is working with the symbolism of the numbers seven and four. Seven is the number of perfection in the Judeo-Christian tradition; God rested on the seventh day; there are seven sacramental rights of import – baptism, confirmation, communion, ordination, marriage, confession, and the anointing of the sick (though note that this is an Anglican interpretation, and most Protestant denominations only recognize the two sacraments of baptism and communion); there are seven seasons in the Christian calendar – Advent, Christmas Epiphany, Lent, Holy Week, Easter, and Pentecost; and there are seven days in the week – Bauman wanted to encourage the rosary being used on all days of the week. The four large beads reflect the symbolism of the number four: four times of prayer in the Episcopal prayer book – morning, noonday, evening, and compline; four season in the year – spring, winter, summer fall; four peaks in the lunar year – spring, and fall equinoxes, summer and winter solstices; four elements – earth, wind, water and fire; four cardinal directions – north, south, east, west; four Gospel texts – Matthew, Mark, Luke and John. The placement of the four large beads forms the four points of the cross. They are therefore called the cruciform beads. I have made this rosary out of wooden beads and homemade clay beads, with a clay cross. I wanted something that looked like it might have been found in the pocket of an old monk's robe back in the 14th century. (Um, the cross is a bit of an overstatement.) But of course, any rosary found in the pocket of a brown homespun monk's robe from the 14th century would have been the Rosary, with a capital R, and the fuller compliment of beads and Hail Marys. The Anglican rosary reflects two aspects of the Protestant tradition – an emphasis on incarnational theology and the influence, and importance, of each person’s individually developing spirituality. As such, there are no set prayers for the Anglican rosary, though there are many suggestions, beginning with those of Lynn Bauman, the originator of the current form of this rosary. The idea is for each person, or group of people, to find the prayers that have particular meaning to them, incorporating them in a way that suits their purposes. Add to this the daily living out in this world, with its seasons, in the church and in nature, and the endless vicissitudes that arise with daybreak, and you can see the array of prayers that may arrive. So, for example, there are sets of prayers that reflect the Celtic influence, the Franciscan tradition, or Julian of Norwich’s approach. There are morning, evening, and mid day rosaries. 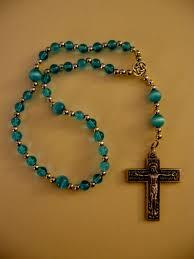 There are rosaries of joyfulness and celebration; rosaries for dying and diminishing. There are sets of prayers arranged for the liturgical seasons, various states of the heart and mind, and the particular needs of the moment. As the combinations are endless, I offer below several websites and an interesting blog that offer a plethora of possibilities. Try not to get lost in the world of possibilities of the Protestant rosary. But if you do, all manner of blessings go with you. And if it all seems like just too much choice, you can return to the tried and true Rosary for comfort.